Jack has been missing out! 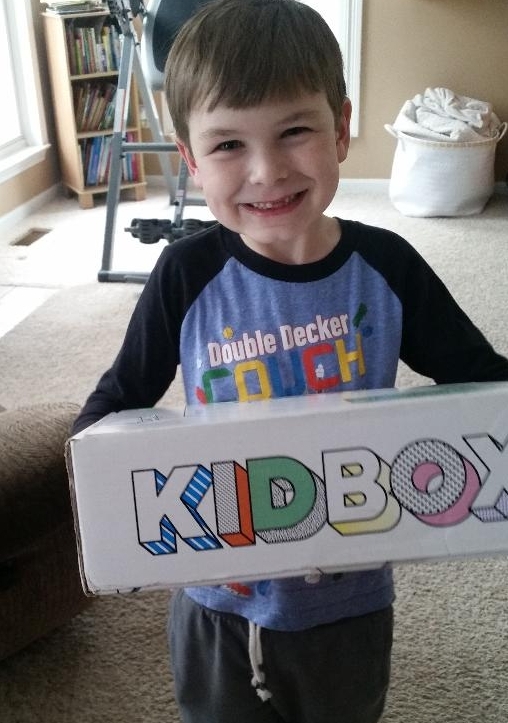 He watches mom get boxes of clothes, and Maggie get boxes of clothes, and he wanted his own box of clothes....enter Kidbox! I ordered a box of clothes from Kidbox for Jack about two weeks ago, and they shipped super fast. The original follow-up said to expect a box within two weeks, and within a few days I received a shipping confirmation. Yay! The Kidbox subscription service is very similar to the two we use for Maggie and me. You get a box of clothes (in this case, there is no styling fee in advance) and pick what you want to keep, then send the rest back in a postage paid envelope that's included in your box. There's a discount for keeping everything in your box, and with Kidbox, if you keep the whole box, they also make a new clothes donation to a family in need. How great is that?! Jack received seven total items in his box, plus a pack of thank-you postcards that he can use to send cute thank-yous to friends and family who gift him thing through the year. His clothing items in this winter box were three pairs of joggers (he had requested not to receive any denim), one zip-front hoodie, and three long-sleeve shirts. 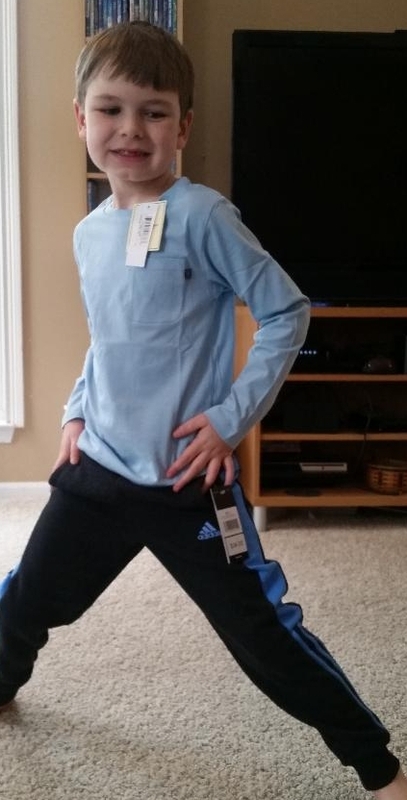 The first outfit he eagerly tried on was the Eland boys long sleeve tee (retail price $22, Kidbox special price $18) with the Adidas boys' jogger (retail price $34, Kidbox special price $26). I would love to explain their pricing, but I really don't get it. I just saw that the whole box is a good deal and didn't worry about the details. 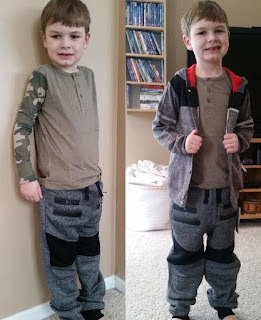 LOL The fit on the joggers (size 7) and the shirt (size 6) was just right for Jack, and he says he wants to keep this outfit and wear it (it's been a week, and he hasn't worn it yet...). The next outfit in our fashion show was the LRG boys raglan henley in red (retail price $18, Kidbox special price $14) with the Puma boys joggers in black (retail price $36, Kidbox special price $27). Both items were again comfy, fit well, and stylish. In retrospect, I should have had him try this shirt on with the next joggers, but what's done is done, and the pictures are already taken. LOL I'm also kind of shocked at the idea of paying $36 regular retail for a pair of kids' sweat pants, but my end price made much more sense. Not sure if my sticker shock was because this is 'name brand' stuff, or just because we get so many hand-me-downs I don't have to actually buy too many clothes usually. The final outfit to try on was actually three pieces, and as I already admitted, probably would have gone better with the red shirt (I think it would have popped better with the gray of the pants, and coordinated nicely with the hood lining of the jacket). Here he's wearing the Silver Jeans boys long sleeve henley in green (retail price $26, Kidbox special price $19) with the Paper Denim & Cloth boys knit joggers in black (retail price $46, Kidbox special price $35), shown here with and without the DKNY boys zip front hoodie in grey (retail price $46, Kidbox special price $37). In the semi-dark family room the evening we opened the box, I thought the pants and jacket matched, but on further review, they're actually different brands. I never claimed to be a fashionista. Jack actually left these pants and shirt on as we headed to swim class the same evening. Overall, Jack and I enjoyed our first Kidbox. The pricing as I said looks somewhat confusing, but I kept everything in the box for $88.20. You can also get a discount by using my referral link: http://refer.kidbox.com/hL7nn (I would also get another discount. Discount not applicable on baby boxes.) Also worth noting, I've edited our preferences to allow denim in the next box. While Jack does wear mostly non-denim pants, I like some of the stylish stuff we've seen both in our own box, and in ads I've seen for Kidbox. I'm excited to check out a little different box next time. Love the excitement this kid shows 😘. Love this kid even more!!! Super cute! I'm sad since Keira feels she's too mature now for her boxes. Never mind that I have a ton of items sitting in her closet from the last box that she promised to wear. Someone enjoys the camera �� way to much!! As a boy mom, I love the look of the reinforced knee in those third pants! My guy doesn't love denim either, but he's too rough on sweats/joggers. Those look sweet!! What a fun subscription box! I can’t get over how Jack is in front of the camera, he reminds me of my daughter. She could be in her own little world all day long and second I go to pull out my phone to do a video or take pictures she’s got to be right there .